British SUV manufacturer Land Rover has divided itself into high-end Range Rover and more pedestrian Discovery lines, with the two aimed at different consumers. Certainly, you could pay upwards of $200,000 for one Range Rover model, but if your SUV aspirations are more down to earth, then the Land Rover Range Rover Evoque with a starting price of $41,100 may be more to your liking. Notably, the Evoque is the smallest and least costly of all Range Rover models, an all-wheel drive compact SUV with room for five. 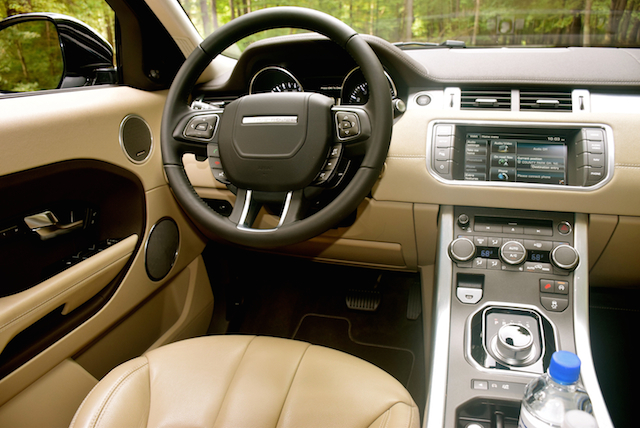 Range Rover offers the Evoque in a traditional 5-door layout or as a coupe. The 5-door rendition was a recent weekly loaner from Land Rover and it was outfitted with just over $10,000 in package upgrades. Think “Land Rover” and forced induction should come to mind. That’s because this British marque relies exclusively on performance boosting to squeeze more power from its engines. 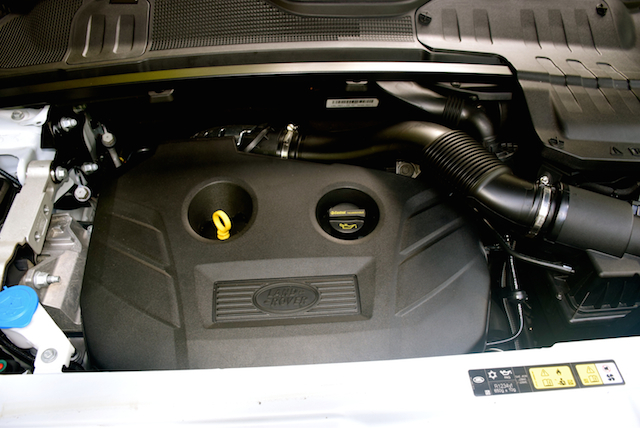 Most Land Rover (and Jaguar models for that matter), are powered by supercharged 3.0-liter V-6 or 5.0-liter V-8 engines. 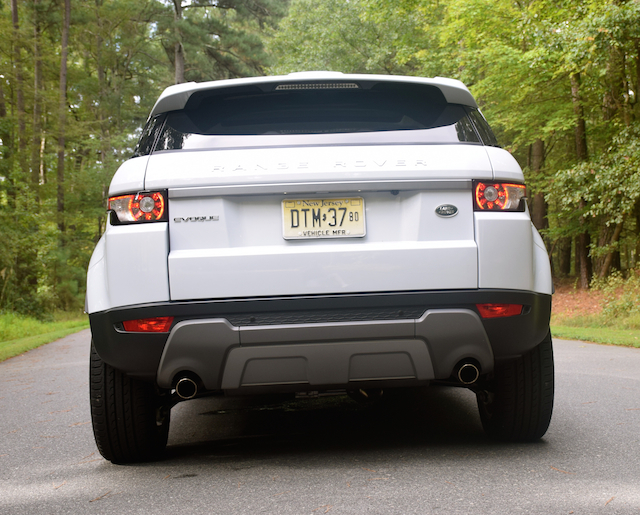 In the case of the Range Rover Evoque, this model relies on a 2.0-liter, turbocharged four-cylinder engine, enabling it to attain 240 horsepower and 250 foot-pounds of torque. Land Rover pairs this model with a 9-speed automatic transmission supplied by the German automotive components manufacturer, ZF. Before we examine the Evoque’s performance numbers closely, we’ll consider its countenance. In particular, beginning with the front fascia, itself marked by a split horizontal chrome grille augmented by a wraparound lighting assembly. The lower grille opening is larger and protected, at least in part, by a skid plate. Oversized embrasures at the corners of the front bumper house a pair of LED daytime running lights. The Evoque’s broad and muscular hood gives this model an imposing presentation, one that is amplified by its strong shoulders and deeply arched wheel wells. Multiple character lines are found across the profile. A high and rising belt line and a sloping roof give this vehicle a sporty as well as a commanding presence. As the roof line tapers it ends at a pronounced rear spoiler. Wraparound tail lights, rear fog lights, two exhaust tips, and a rear skid plate are also present. 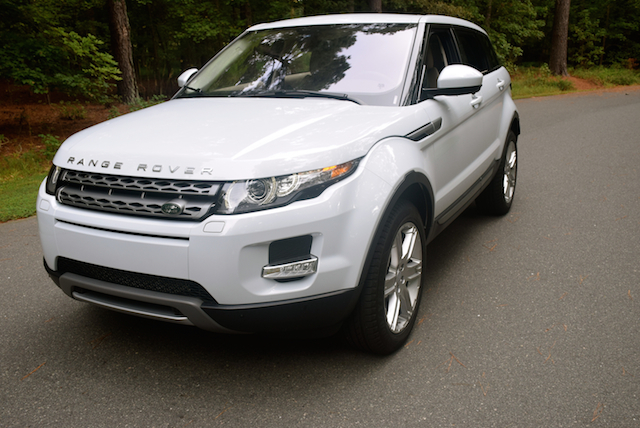 The Range Rover Evoque can be had in SE ($41,475), SE Premium ($45,675), HSE ($50,475), and HSE Dynamic ($53,775) trim levels. Fully loaded, this model can approach $60,000. 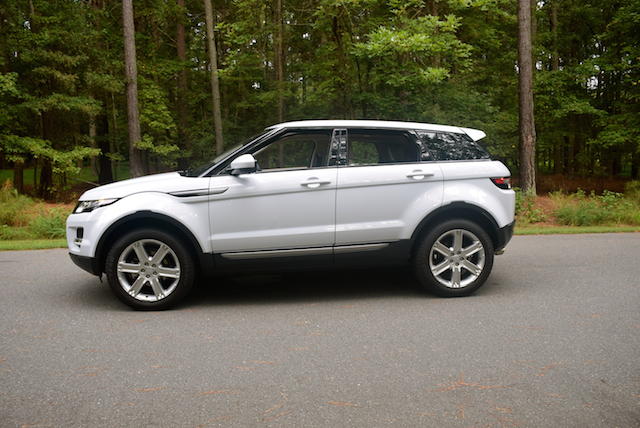 Add about $5,000 if the Evoque Coupe is on your list. 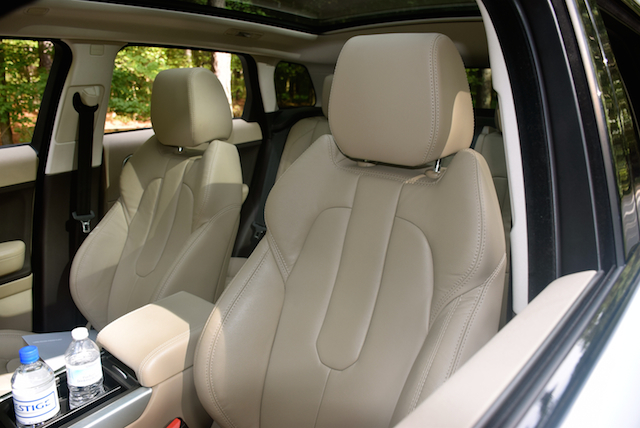 Inside, the Range Rover Evoque offers generous room for five with a pair of thickly bolstered and lavishly padded seats up front and a 40-20-40 split fold down seat to the rear. Leather, chrome wood and other high-end materials are used throughout the cabin, a two-tone work of art with a moderately simple formation. Slip behind the leather-wrapped steering wheel and a tilt and telescopic column are at the ready. Cruise and audio controls are found on the face of the wheel. Behind it is an instrument panel, with tachometer and speedometer displays. In the center of that display is a digital driver’s information center. Land Rover keeps things simple with the center stack, itself dominated by a color touch screen display with attendant switches to the left and to the right. The console flows from the stack to the arm rest/storage compartment, and applies switches and knobs to operate the Meridian audio system, climate control, the emergency brake and all-wheel drive functions. The transmission knob emerges from the center of the console and is followed by cup holders and a smart phone holder. USB ports and an auxiliary input port are present inside of the storage compartment. Underneath the flowing console is an open storage compartment. 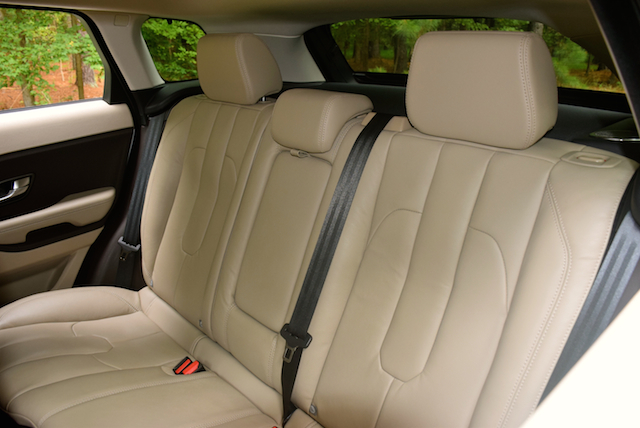 Power-operated, 12-way perforated grain leather seats with lumbar support and driver’s memory is standard for the Evoque. Oxford leather is standard for the HSE edition on up. 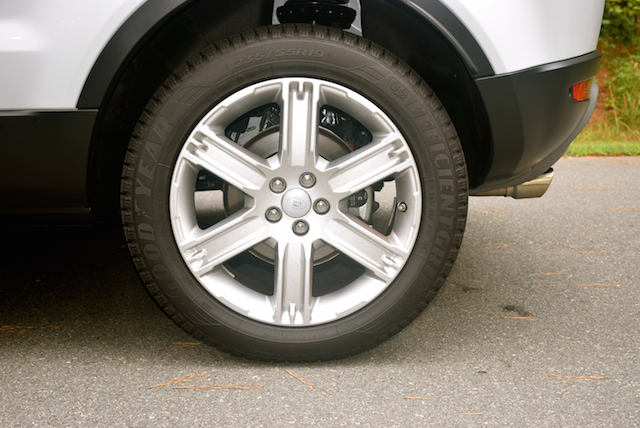 Alloy wheels, a front parking aid and ambient lighting are included. Select models bring in front fog lights, automatic leveling, a navigation system, a panoramic glass roof with an integrated sun blind, brake assist, heated front seats, illuminated tread plates, and a rear aero flip spoiler. Because Land Rover is as much about its off-road capabilities as well as its on-road behavior, this model comes equipped with numerous features to enhance the terrain experience. These include: hill descent control, roll stability control, and an active driveline in addition to torque vectoring. Press the start button and the transmission shifter knob emerges, leaving its previous flush-with-the-console residence. You can operate the transmission in standard or sport mode, the latter enabling you to advance through all nine forward gears with ease. Step on the accelerator and the Evoque moves capably forward. Hammer the accelerator and be prepared for some hesitation as the turbocharger spools up. Admittedly, the turbo lag was noticeable, especially as every Jaguar Land Rover (JLR) product to date was outfitted with a supercharger, my preferred method of forced induction. I cannot give you the reason why Land Rover went with the turbo.However, that it is a less costly choice than a supercharger is a likely factor. That it is the only powertrain combination for this model could cost it some sales, especially when competitors such as BMW offer larger engines as well as turbodiesel options at that. One area that certainly was not a complaint was the transmission. ZF has been supplying 8- and 9-speed transmissions to manufacturers around the world in much greater numbers of late, but complaints of mapping or shifting problems have followed. But that was not so with the Evoque as this model shifted smoothly and capably between gears with no hunting noted. On-road handling is more than satisfactory; the steering is balanced and augmented by the torque vectoring system. Due in part to its compact size, its advanced design as well as its engineering dynamics, the Evoque maintained its composure on twisty roads as well as around corners, with very little body roll noted. Perhaps not as adept as a BMW X3, but equal to the Lexus NX. I’ve tested both models. For this test I did not take the Evoque off road. My previous off-road experiences with Land Rover products is that these vehicles can handle a variety of surfaces, thanks to its terrain management system. The response settings include general driving; grass, gravel, and snow; mud and ruts; and sand. Choosing the correct mode enables you to take this handsome urban traveler to places most competing models simply won’t go.